1961: it's the year when Antonio Carpenedo and Giuseppina decided to get married. Their union is indissoluble, made of emotions and feelings, and both share the same passion for the world of cheese. They are used to get many ideas and inspiration from their outings among mountain pastures and small traditional dairies to create great ripened cheeses. But this time Antonio goes beyond by dedicating a cheese to their passionate union, "Blu '61", a cheese that makes fall in love! TYPE: Blue cheese produced with cow's milk, ripened with fine Raboso passito wine and red cranberries.The cheese has a minimum maturing of three months, the paste is soft tending to become creamy when the cheese is more aged, the rind is thin and covered with red cranberries. TASTING NOTES: Blu '61 is peculiar for its elegance and harmony. The aromatic and intense notes typical of the blue cheese are wrapped by the scents of marasca cherry and fruit of Passito di Raboso wine. MATCHES: we suggest Passito di Raboso wine or other raisin wines, preferably red. We can match to the cheese a compote of balsamic vinegar and fruit. 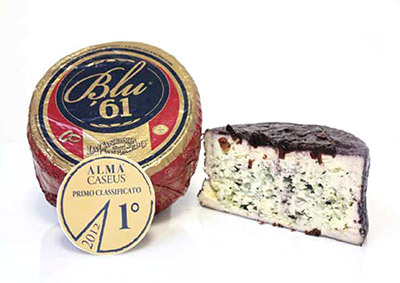 AWARDS: The cheese has been first presented at Cibus 2012 and has been awarded the Gold Medal of Alma Caseus Contest at First Place in the blue cheeses class. This was the judgment of the panel: "the product is perfectly balanced in flavor and structure, fairly sweet although blue. The winey notes due to the presence of marcs, never invasive, commendable match with the scents of milk and the blue cheese "